I’ve been thinking a lot these past few weeks about standards-based instruction. 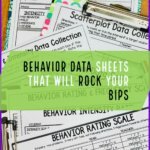 I’ve been working on a presentation to help teachers teach based on the standards. Most (if not all) states require standards-based instruction be identified in the IEP. In addition, we evaluate our students based on the grade-level standards, even the students taking the alternate assessment. So, how do we keep what we teach relevant to the lives of most of our students? How do we make our teaching meaningful and functional for students who are not college bound. For those students who will need significant support after school, how do we help them use science and social studies information daily? I know many of you struggle with this. And some states provide more support than others in terms of helping you. And there are probably times when we all have to take the path of teaching a skill BECAUSE it’s related to the standard instead of because the student needs it. Wouldn’t it be great, though, if most of our instruction could have meaning in the real-world for our students and still meet our state requirements? Wouldn’t it be amazing if what we spent most of our time teaching skills the students will use when they leave us…whether they are 5, 15, or 21? I thought it would be good to talk about some things you can do to help this happen. I thought we would have moved past this at this point, but I still meet teachers who swear their district (or state) told them that the goal had to BE a standard. This is not the point of IDEA or the states’ push for standards-based IEPs. Sometimes, especially in the early days, states and district were indeed saying this. However, I hope that we have moved away from this because it makes no sense for several reasons. First, the standards are not measurable…so they don’t make sense in an IEP. They are too broad to be good IEP goals. And of course if the student is on alternate assessment, the standard is so high there is no way he or she could possibly master it. We need to write the goals connected to the standards. 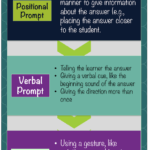 Some states have developed some great resources for how to unpack the standard to reveal the basic skill this particular student needs to learn to move forward. Some states have identified specific standards that you choose from to teach. These are often extended standards (Alabama) or essential elements (Kansas). Many states have developed alternate or extended standards (e.g., Alabama, Florida) or content that is specified should be taught. Our job, as educators (therapists and teachers alike), is to extract the element that can be relevant and meaningful to our student. What is the precursor or essential element that a student needs to learn. In some states there is more flexibility than others. For instance, from what I can tell (and I’m not an expert in every state’s standards), Alabama requires specific standards to be taught. So, we do have to spend time teaching Civil War battlefields within the state (at least you did at one point–this might have changed). Whereas in Kansas you choose the essential element that applies most to the student’s educational level. Break the standard down to its core elements and the essence of what it is trying to teach. Some states have done this for you; some have done it and it’s hard to locate. And most likely others have not done this as much. Breaking the standards down means figuring out what the prerequisite skills are that are needed for the student to be able to move toward the standard. For instance, a student who can’t count with 1-1 correspondence cannot add, so counting becomes one of the fundamental skills. I would then take counting and turn it into a vocational or daily living skill, similar to what I described in this post. And you can also relate it to money, using a template, as I wrote about in this post. (Both those posts have free downloads in them by the way). Finally, there will always be standards that students have to learn that are difficult to integrate into functional activities. In those cases, try to use them to practice skills that are functional. This is similar to what Unique Learning Systems often does. For instance, you can incorporate scientific principles into cooking. 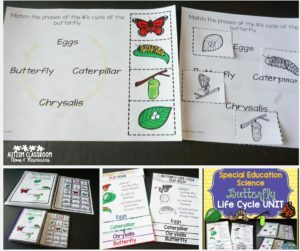 You can incorporate learning about the life cycle by planting a garden and having students write about their observations of the plants’ development. Let me give you two general examples (and some downloadable tools to help) of ways to do this. Some of the social studies standards focuses on civics including personal economics. Those standards are easy to put into practice in a functional curriculum. We can teach it through shopping tasks and budgeting activities like debit card use. Things like history and government, however, are more difficult. For instance, we can teach who is president…but in 4 or 8 years that will change. We can teach about elections, but all types of elections are different. And of course some elements of history and government are pretty abstract. So, one solution is to take the standards (like finding the Civil War battlefields) and having students learn to use tools to research them. Teaching them how to responsibly use the internet, how to locate new and needed information, and determine if it’s accurate is an important life skill. Let’s face it, that’s how this generation (and even our generation) is going to get most of their information from the web. Learning how to navigate it well is a functional skill you can put to use to investigate the election candidates, the laws in certain areas, different countries and and historical events. 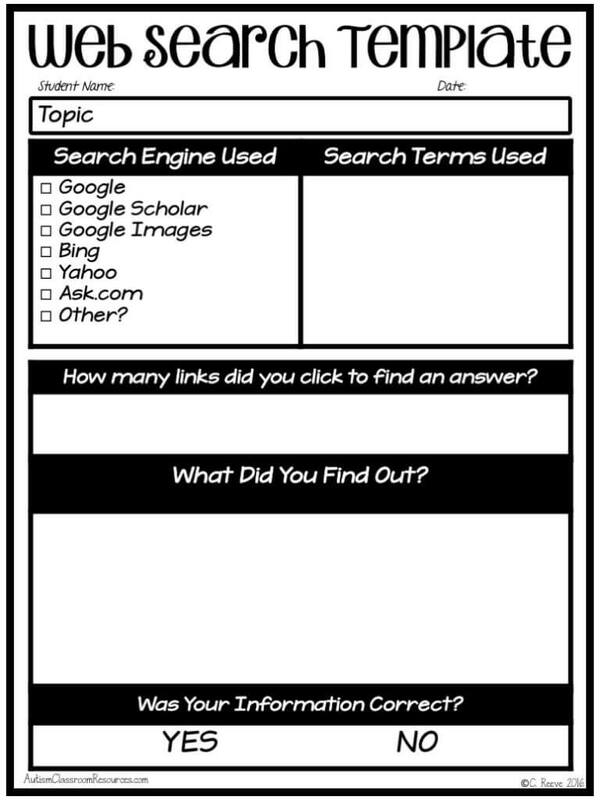 To help with this, I made an example of a template for a student to complete to do a web search. It’s in PDF form to maintain the fonts but you can easily either use it or recreate it. You can download it here. Similarly understanding elements of physics is something that would be difficult for our students to understand. 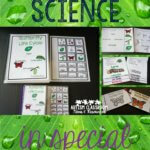 However, science experiments not only give us a hands-on way to teach science concepts, but they also teach them to use the scientific method. And what is the scientific method? A problem-solving strategy. Making a hypothesis or a guess, testing strategies, and observing the results is part of solving a problem, scientific or not. 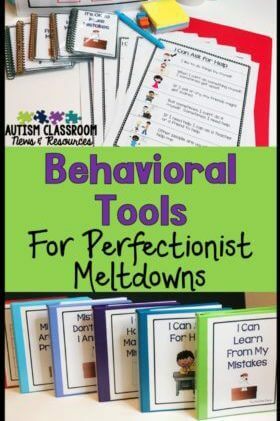 You can also fold in skills like following directions to complete the experiment, writing about their observations, etc. 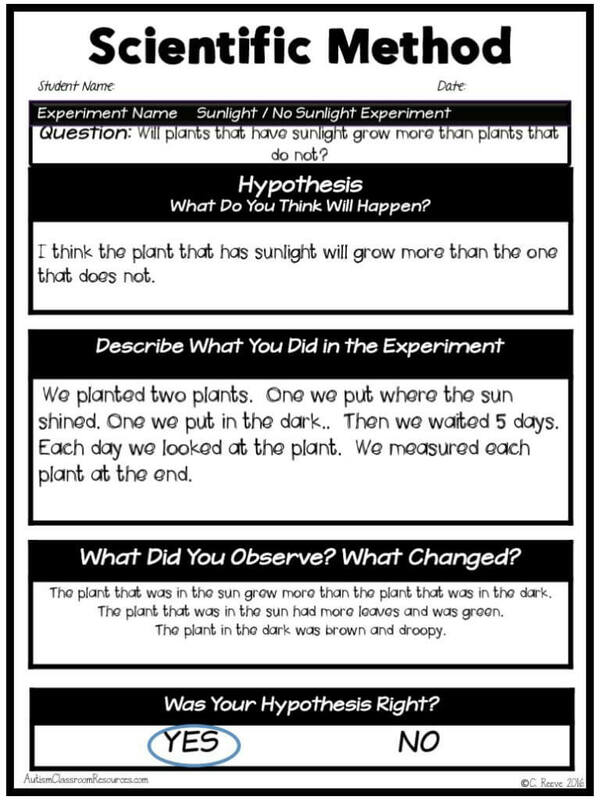 However, understanding the scientific method is a great way to evaluate questions about how things happen in the world. So, I’ve included a template for experiments you can use as well. It’s also in PDF but could be easily recreated for different uses. And I expect you’ll see it again tailored for specific science products coming to my store. 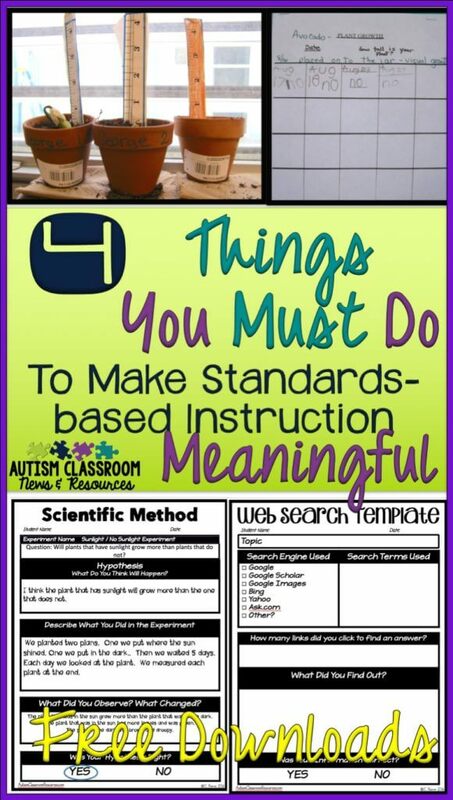 So I hope this gave you some thoughts when planning standards-based instruction so that it can meet our state requirements while also being meaningful to our students. 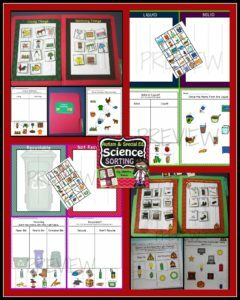 If you are looking for materials to help your students learn science standards you might want to check out some of the materials below. Just click them to check them out in my store. « What Kind of Visual Schedule Do I Need? GREAT post. Thanks so much for sharing it! Wow! I agree – I plan on forwarding this post to some of our teachers. Thumbs Up! I am lucky that I don’t have to focus on any specific standards at all. I can pick whatever grade level I want, and many are similar for reading and writing, and interpret it myself. For math and reading, I focus on the skill and then find a standard to match it. But no one ever checks to see what standards I use except when I am being evaluated. I write the overarching standard on the board, and I am good to go if anyone ever steps in my room. Hopefully, like all new and innovative education ideas, this one will either go by the wayside for SPED teachers, or they will fix it so that it makes sense for our students. 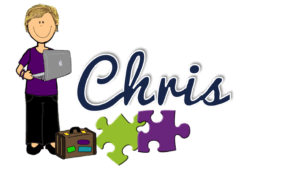 Thank you for sharing these ideas (they were helpful) and for sharing your resources.